Yearling doe born in April 2012. Dam is Saanen, Sire is mixed dairy x meat. Spice is small - she was the smaller kid of twins and has stayed small, but she is healthy. I do regular FAMACHA checks on all of our goats and deworm as needed. Her hooves were last trimmed on 5/4/13. I will be happy to touch up the hoof trim before she leaves. Spice is similar in size to a Nigerian Dwarf. If I were going to keep her for breeding, I would consider crossing her with a Nigerian Dwarf buck, to produce kids with more dairy-ish tendencies. Her dam is an excellent milk producer. 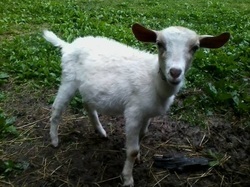 She would also make a great pet, for someone who just wants to keep 2 or 3 small pet goats.